스르르와 척은 캐릭터 브랜드 샵을 목적으로 디자인된 캐릭터로 현시대를 사는 20대의 이야기를 담고 있습니다. 어쩐지 열심히 일해도 더욱 가난해지고, 결혼도, 아이도 갖지 않는 선택을 하게 만드는 워킹푸어, 베이비, 허니문 푸어등 각종 신조어가 생겨나는 답답한 현실을 사는 20대의 모습을 귀여운 캐릭터로 역설적이면서도 무겁지만은 않게, 동물의 습성에 빗대어 우화적으로 공감을 끌어내며 이야기를 풀어냅니다. 언제나 스르르 잠이 드는 수달 스르르는 이래도 그만, 저래도 그만 어차피 바뀔 것은 없다는 주의로 언제나 대충대충, 슬렁슬렁 게으르게 하루 잡아 하루 먹고 살며 물에 떠있는 것조차 귀찮아 떠내려온 튜브에 매달려 사는 수달, 스르르 입니다. 척은 언제나 일이 척척척 진행되어야 불안하지 않은 비버입니다. 언제나 집을 짓지만, 아무리 열심히 노력해도 볼품없는 척의 작은 집으로는 언제나 번번이 구애에 실패하곤 하지만, 포기하지 않고 계속 노력하는 모습이 어쩐지 안쓰러운 비버, 척입니다. 이러한 스르르와 척이라는 캐릭터를 이용하여 귀차니스트를 위한 제품라인, 열심히 생활하는 사람들을 위한 제품라인을 발전시켜 공감과 이야기가 담긴 제품의 브랜드 캐릭터 샵을 만드는 것을 목표로 작업하였습니다. 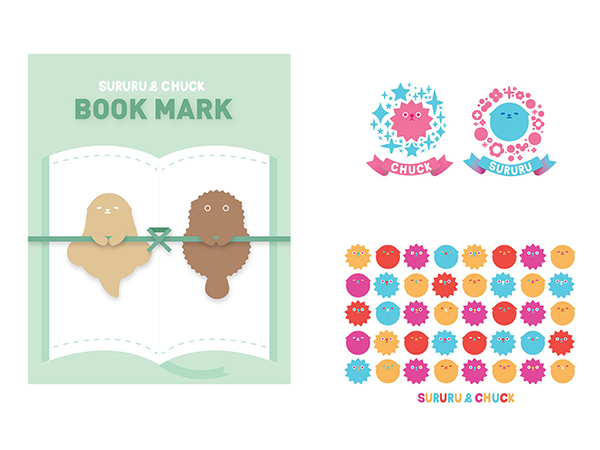 Sururu and Chuck is character design for character brand shop. 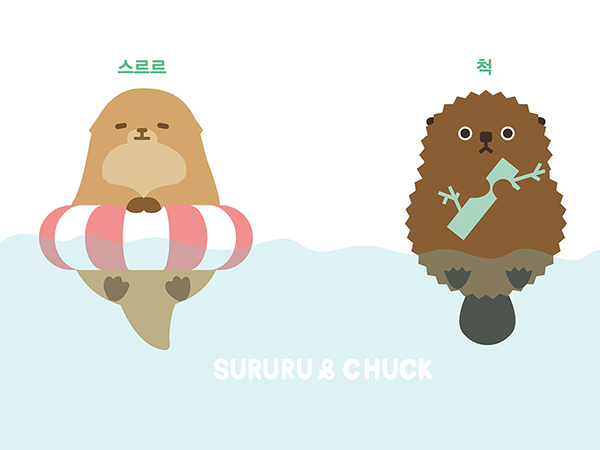 ‘Sururu and Chuck ‘ represents Korea’s young generation’s characteristics. Sururu is river otter and he is tired of everything, he is very lazy and do not want to live hard because he thinks nothing changes even if he tried hard. Chuck has opposite personality. 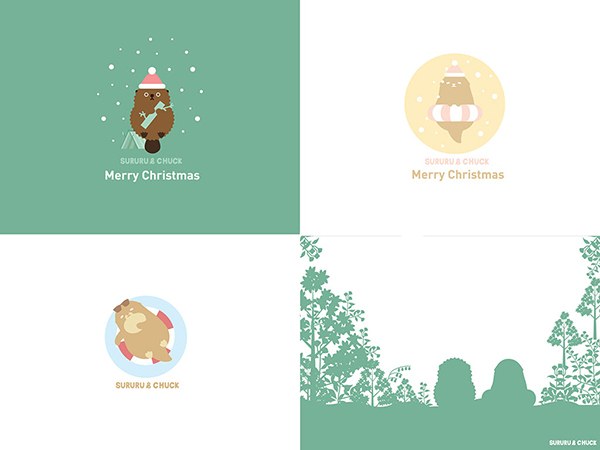 He is beaver. 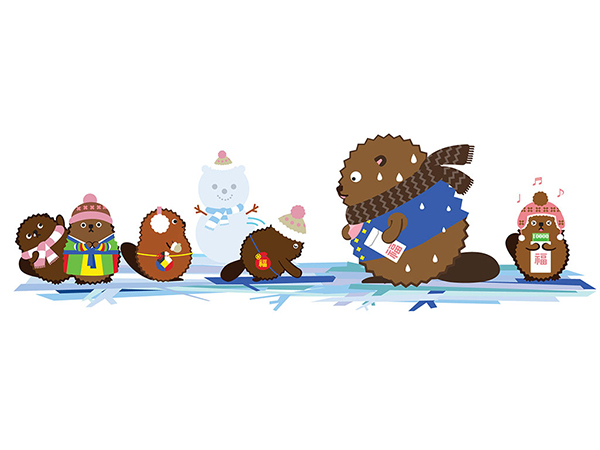 Chuck is very diligent and always work hard to make his own house, get a wife beaver but no women beaver are interested in Chuck because Chuck’s house is too small but Chuck never give up to find and always live his life enthusiastically even though he could not get as he work hard. From these personalities of characters, I wanted to bring up the issues of Korea’s recent social problem that young people work hard but get poorer and can’t get married because they don’t have money and more, they don’t want to have a baby because raising a baby costs extremely in Korea so people start give up to make an efforts to make better life like sururu or some people still try hard to change their life better but still very difficult like beaver chuck. I wanted to show these stories using animals in a very cute way to make more contradiction so people could feel something but at the same time, they would not get depressed. And Sururu and Chuck is not just stories. 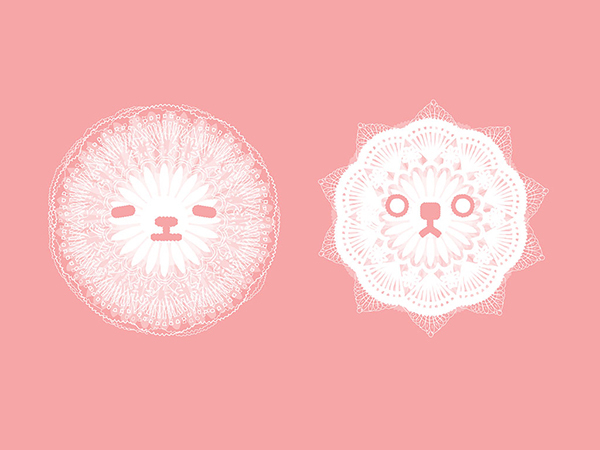 I have intention to make branding shop using Sururu and Chuck by making two lines of product. One for the lazy young people like sururu and one for people who work hard like chuck. and one for people who work hard like chuck.